Free PDF to Flash Magazine is powerful and lightning-fast converter software to enable you to convert all PDF content to animated flash pages. It is developed user-friendly for e-education industry, e-learner, business man, and so on. Its powerful functions decide its widespread applications. Convert PDF file with free PDF to Flash Magazine enables to display PDF file in a different way. PDF file is no longer a common e-document. It will display as flash slides and can be opened with browser. It will show us more detail information about the slide show, such as About the Company and About the Author. 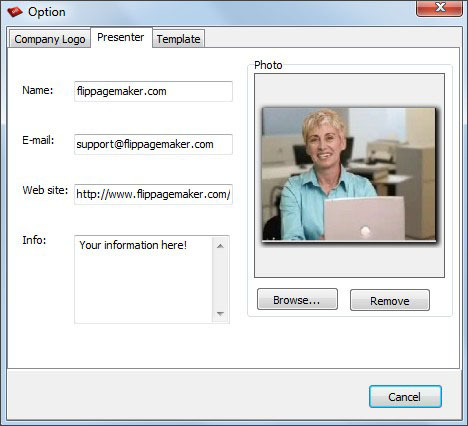 So, what actually can you do with FlipPageMaker free PDF to Flash Magazine? Firstly, you can add text, line, shapes, and highlight part into pages. 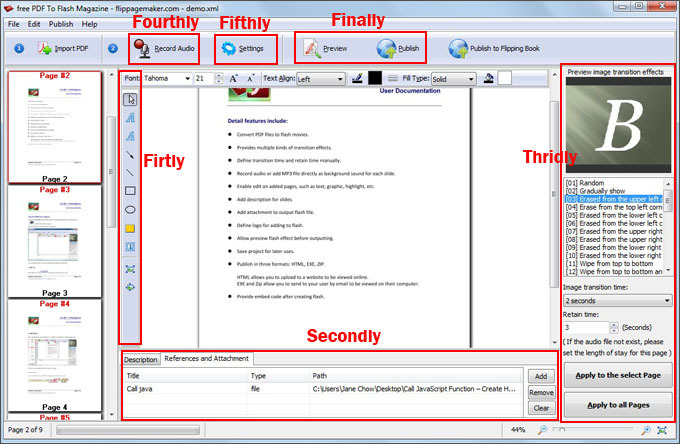 The freeware provides basic editing functions. You can edit pages contents by inserting text descriptions. If necessary, you can blur any part on pages. To highlight words, you can add line, shape, or highlight area to make them standout easily. There is a suspending toolbar in the left of the window. Secondly, add References and Attachment to the slide flash magazine. In the bottom of the window, please click “References and Attachment” -> “Add”, and insert Link or File as attachment to the slide flash magazine. Then readers can open your attachment directly when reading the book. This feature is really helpful when your book is released for learners and they need more study materials. Thirdly, apply and define different Transition Effects to each page. There are 39 transition effects for you to choose from. Each page of your book can be showed in unique effect. Your published flash magazine will display as cool presentation. But it will be much more attractive than a normal presentation. You can also set Image Transition Time and Retain Time for pages base on specific needs. Of course, if you think it is not necessary to customize transition effect to each page, you can just apply the effect to all pages by simply click icon “Apply to all Pages”. 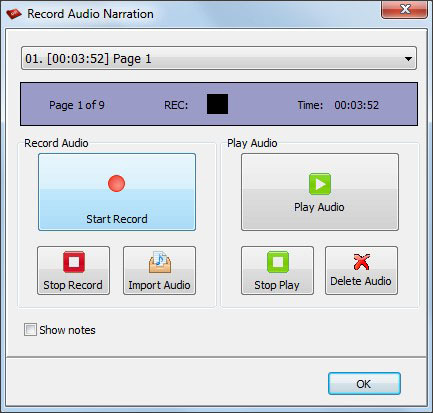 Fourthly, Record Audio Narration or Import Audio file. Audio narrations can enhance a self-running slide show. You can use Free PDF to Flash Magazine to achieve a meeting, so that presenters or absentees can review the presentation later and hear any comments made during the presentation. You can either record a narration before you create a flash magazine or record a narration during a flash magazine. Fifthly, do settings including information about Company and Presenter, and flash template. Template: show or hide Logo, Author Info and Slide List. Finally, Preview and Publish PDF to flash magazine in HTML, EXE, or ZIP format. Preview the result you create before publishing to avoid mistake, so that you can make adjustments and correct it in time. The freeware provides three Output Types: html, zip, and exe. Flash slides in html format can be shared online; flash slides in zip format can be sent to others via email; flash slides in exe format can be viewed on local computer. If you plan to publish your slide magazine onto your website, please do not forget to complete advanced HTML Meta Settings to make it SEO friendly.